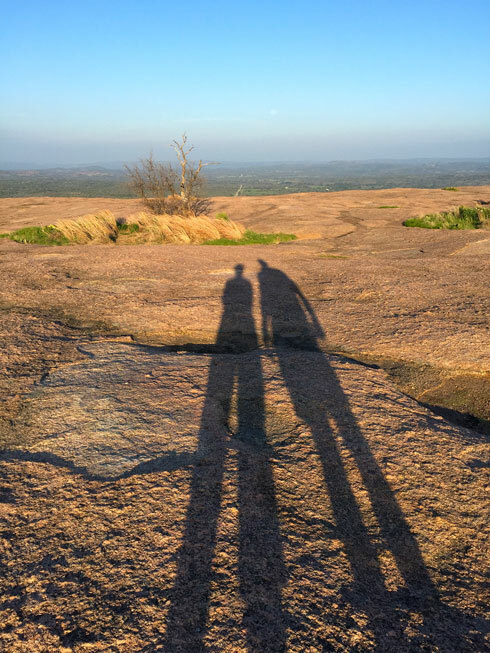 One of my favorite hikes in Texas is to the top of Enchanted Rock, the star attraction at Enchanted Rock State Park near Fredericksburg, Texas. In this image, we are standing at the Geodetic Survey Reference Mark at the top of the rock. Speaking on youth, Roosevelt’s quote encourages you to be practical AND generous with your ideals. Keeping thoroughly grounded, but always reaching for the stars; not staying stuck in one or the other. As we stood at this point, significant enough to be marked with a geodetic marker, we once again felt a sense of accomplishment from hiking the rock and finding the marker (it is not as obvious as you might think). But when we looked up, we were reminded by the universe that there is always more to reach for in life, when we realized the setting sun was stretching our shadows across the summit of the rock, and a full moon was rising directly ahead.